Since I last posted my process for the cover to JLI #2, I have been frantically (well, not really) searching for another cover example that I have more scanned material on. Low and behold I have found one. 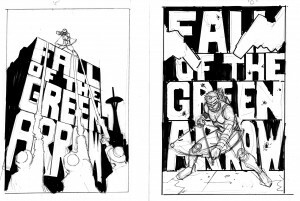 Here now are the steps I went through from conception to completion for the cover to Green Arrow #15! Step one is the same as it always is; the editor gives me some suggestions or ideas about what he would like to see on the cover and then I come up with some 8.5X11 roughs for him to choose from. “A” was chosen so I then took that design and made a full sized 11X17 detailed “rough”. Once that was finished I got editorial approval and then light tabled it on to the DC art board. I tweaked a few things but this served as a very tight template for the finished pencil. After the finished pencil was approved I went to the final stage of inking. I think on this cover I used almost all micron and copic marker pens with a little bit of brush and ink in a few places. For those of you who don’t know, the microns and copic thin line marker pens are archival and don’t fade or change colors like normal markers do (at least they are not supposed to). They are also supposed to be waterproof but I would not be brave enough to test that. And that’s the finished piece of art. 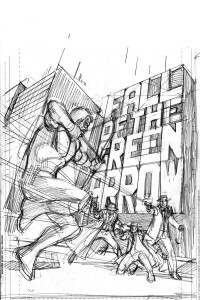 You will notice that the world “THE” was added to the top of the title “Fall of the Green Arrow”. Ironically after adding this with a photoshop patch, it was again removed before publication. Go figure. 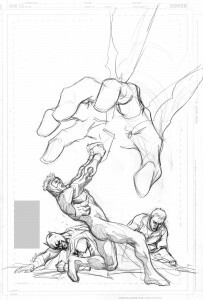 JLI cover #2…How I Did it! I thought it might be mildly interesting and possibly even informative if I posted one of my comic covers and the steps I go through to get from layout to final image. I was going to start with the cover to Justice League International #1 ( it makes sense to start with the first, right?) but looking through my digital records I found that I don’t have scans of all of the steps. So, I am going to start with issue #2 because I do have scans of all of the steps and visual aids are always essential to any good artist’s blog! Like with any cover I do, I got content directions from the editor. Since I have to do covers 3 months in advance of the comic for preview listings, often times there is no script to work from. Since this was the launch of a new series a lot of the stories had been figured out so the editor was able to give me clear instructions of what he was looking for on the cover. 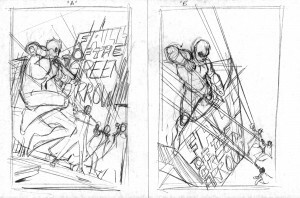 I did three 8.5X11 “thumbnail” sketches for the editor to choose from. The editor chose option #1. Because option #1 was so reliant on the lighting contrast, I drew it in ink so the editor would get a better idea of what I was going for. Once the choice was made I was given instructions to add Batman and Guy Gardner to the composition. 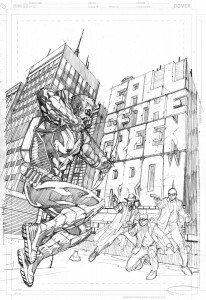 I then did a full size rough (which was actually pretty tight) and incorporated the additional characters. Once this got approved, I used a light table to trace the image on to the final art board and made some minor changes along the way. I took this to a final pencil where all the details were added. Even though I ink my own covers, I usually do the pencils very tight so I don’t have anything to chance in the inking stage. Unfortunately, I don’t have a scan of the finished pencil to show. Once the penciling was done, I used a brush and micron pens to ink the art. In this case I used mostly brush except on the tech parts of the robots hand. And there you have it. The final black and white product. If I have time in my schedule I will color my covers but in this case someone else did the honors. I follow this process in every cover I do. Since it is the most important image of the book, redrawing several times is not uncommon for me. I want to make sure it looks as good as I can make it. In my previous posts I have discussed all of the most influential artists to the development of my visual style and storytelling. However, there are several others that I was hooked on for a short time and in some way probably added to my approach, although I wouldn’t classify them as instrumental in my early development. The first I would like to mention is Jim Starlin. 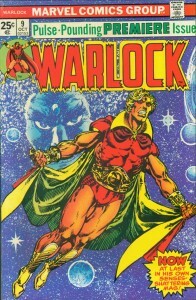 I first discovered his work in the pages of Warlock which started with issue #9. This is a comic that I bought off the newsstands as a kid. The way Starlin delineated musculature in his characters was very influential in my initial attempts at superhero art. 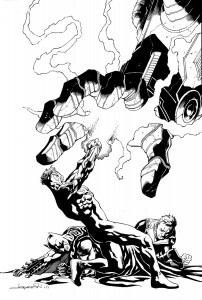 I remember specifically adapting the way Starlin drew arm muscles in my own work for awhile. I later went back and discovered his Captain Marvel work (which I loved and still do). I have to also mention John Buscema’s work. I love Big John’s work. While a lot of people love his Conan work, I love his superhero work the best. Silver Surfer was probably his greatest achievement but everything he did from the Avengers to the FF to Sub Mariner, I thought was great. He just drew so well. His combination of drawing ability and Kirby dynamics really made him special. As much as I admired and loved his work, he was never a big stylistic influence on me….strange. Mike Ploog also deserves prominent mention here. I always liked Ploog’s monster work (most notably Man-Thing) but again he never really influenced my style. However, I became a much bigger Ploog fan when I met and befriended him in the 90’s. He’s really a terrific guy. 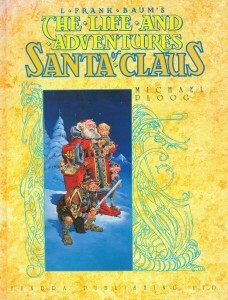 But he provided me with great inspiration as a fledgling artist when I saw his Santa Claus book. What an amazing accomplishment. That book may be my favorite graphic novel of all time and every time I need some artistic inspiration I crack it open. When I was trying to break into comics, Michael Golden took the time (because of mutual friend Renee Whitterstaetter) to explain storytelling and comic acting to me in way that I really understood and it changed my life. Based on Michael’s advice and instruction I was able to get superhero work at Marvel (a great story for another time). I’m also a big fan of Bolland’s Killing Joke work (arguably the greatest single artistic effort in comics) , all of Adam Hughes’ work, Travis Charest awesomeness and Kevin Nowlan’s ingenious use of blacks. I am constantly looking at great work that a lot of people are doing. It helps me keep growing as an artist and challenging myself to be better. Neal Adams and Jim Steranko both had a huge influence in creating my professional style. Adams work has affected every aspect of my comic art from storytelling to how I draw my figures. 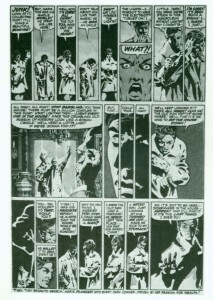 Steranko’s influence was and is more directed toward page design and storytelling. Once again I was too young to experience either of these artist’s when their best work came out but I did discover their art while collecting back issues of comics. I probably discovered Steranko first when I picked up his legendary three issue Captain America story (#110, 111,113). If memory serves it was Cap #113 that I first saw and I was completely blown away. Not so much by his drawing per say, but more for his dramatic use of lighting and his incredible and unique storytelling and page layouts. Steranko was the first artist I saw who creatively worked his story titles into his art (I know Eisner did this years earlier in his Spirit work but I did not see that until much later). Despite his stellar work on Captain America, I still think Steranko’s work in Tower of Shadows #1 is his best. 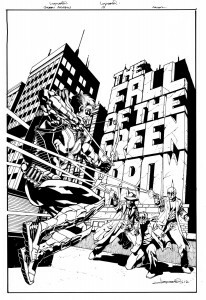 You might not clearly see any Steranko influence in my work these days unless it is a story I have written myself (check out my Garbage Man work). When I have control over the story it is much easier for me to manipulate the visuals in a (hopefully) clever manner that goes beyond simply presenting the story. 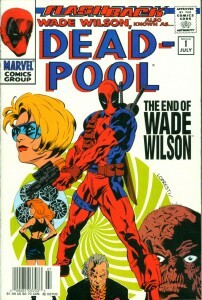 I did an homage to Steranko in the Deadpool #-1 issue I drew for Marvel. Not only is the cover a clear example of Steranko influence but the interiors are intended to be as well. To this day, Steranko is the only artist that I have ever done that with. Although I probably discovered Neal Adams later than Steranko, his work has had much more of an overall impact on the development of my style. The first comic I owned as a child was Amazing Adventures #7 but since I was only 6 at the time I don’t think I really recognized it as “Neal Adams”. The first artistically impactful Adams work I remember was his short run on the Avengers. His realistic treatment of the characters along with his dramatic storytelling and his fresh and unusual “camera” angles really changed the way I looked at comic art. His composition within a given panel was as interesting and clever as his page layouts. Choosing a “worms eye view” or “low angle” shot from behind the main character was completely unexpected but an Adams standard. Although I never tried to copy his drawing style, I did try and adopt his approach and presentation. There are many panels in my comic work that you can clearly identify as a “Neal Adams” shot or pose. Once a fellow artist said to me that he couldn’t understand why everyone made such a big deal out of Neal Adams’ work. I almost slapped him! Perhaps he had never seen Adams classic work on Batman, Deadman, The Spectre , The X-men or The Avengers. I know it seems unlikely but I will give him the benefit of the doubt. For my money, Adams ranks right up there with Frazetta (and now currently Adam Hughes) as the comic artists with greatest innate drawing abilities. In other words, they were born with the greatest portion of God given talent. 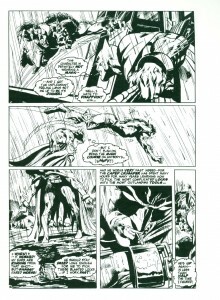 Just look at Adams’ sample work as a 16 year old (check out the Neal Adams Treasury) and you will no doubt agree .